The Five Ten Hiangle is a super downturned, high performance sport climbing and bouldering rock climbing shoe that excels on steep terrain. Standing out from the crowd by offering a higher level of comfort and stiffer midsole than many of its contemporaries, the Five Ten Hiangle provides more support and improved edging. Similar to the 5.10 Team in terms of general fit, the Hiangle is far easier to pull on and off thanks to a more relaxed entry cuff. 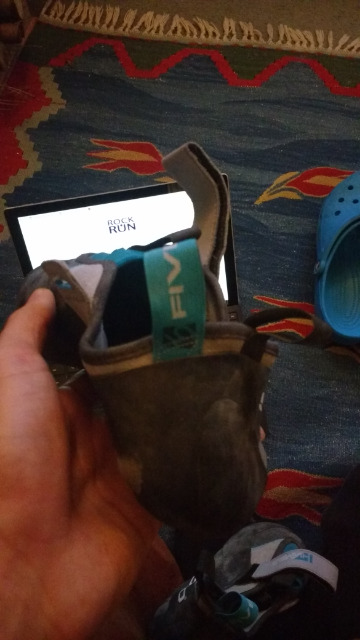 The upper is also entirely a split leather construction rather than the 100% synthetic uppers used in Five Ten's other down-turned rock climbing shoes, so the Hiangle will conform to the climber's feet much faster, but it will also stretch more - up to a full size with time. To further improve its edging capabilities the Hiangle comes equipped with Stealth C4, one of the stickiest formulas on the market which holds an edge like no other. This is my 3rd pair of Hiangles, I found getting them tight is needed as they stretch out quickly ( I went a full UK size down from my street shoe and it only took 2 sessions for them to become comfy). 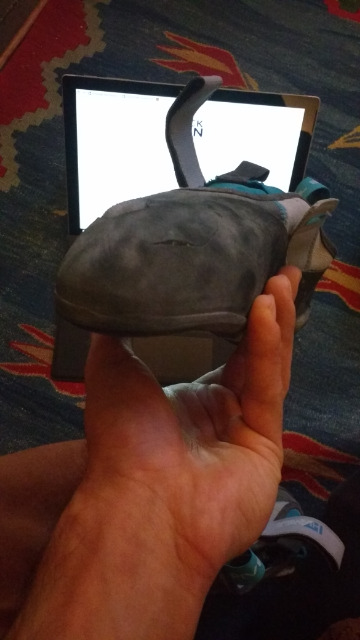 Once broken in they are amazing, the C4 rubber sticks like s*#t to a blanket!, the shoe edges well and the heel is probably the best five ten do ( for my feet anyway). The Sevice from Rock and Run was perfect as usual. Good shoes so far, I've had multiple pairs of 5.10s (dragons and black teams) and these seem to be better quality (fabric and heel tags wise). Only had a few sessions at the wall in these shoes but starting to get a feel for them and they are awesome! Got really nicely straight out the box and keep getting better. Hi angles are great recommend half size down as the do stretch, felt super tight on first session but gradually moulded to my feet after a few sessions. The shoe felt good and like it should've fit but I think I needed about two sizes bigger than my street size for it not to be pinching on my toes...the problems of having roman toe type!!! Amazing service from Rock + Run thank you guys! !